53 episodes of A Green Way Forward since the first episode, which aired on January 15th, 2018. Jennifer Sullivan from the Green Party U.S. Women's Caucus. Green Party members from across the country will converge on Washington, D.C., the week of April 1-5 to lobby their senators and representatives to support public-only funding for their campaigns. Ripped from the headlines! Michael and David talk about the Global Youth Climate Strike, how white supremacist, anti-Muslim terrorism like the Christchurch New Zealand shooting is fueled by imperialist state violence, and how the college admission scandal reveals the cruel lie of meritocracy within capitalism. The second Monday of the month means our guest is Green Party of the United States Co-Chair Gloria Mattera! Episode 46: John Eder on How Maine Got Ranked Choice Voting...and You Can Too! Special guest John Eder, a Maine Green who has served in the state legislature and was a leader in the successful movement to bring Ranked Choice Voting to Maine elections. David and Michael discuss recent Green Party press on the Green New Deal, plus more topics from the Live Chat! Episode 43: What Should The Green Party Focus on in 2019? David and Michael outline how Greens can spend their 2019 making real gains for the movement while preparing for the nightmare that will be 2020. Episode 40: Will The REAL Green New Deal Please Stand Up? David and Michael discuss the three different Green New Deals before our country, and how to fight for the one that will truly transform society and avert climate catastrophe. Episode 39: What We MUST Learn From 2018! Michael O'Neil interviews radical theater producer and activist Siobhan O'Loughlin about her volunteer work with Refugee Support Europe providing direct aid to migrant caravan refugees at the US/Mexico border. Episode 36: So... how are we doing? Audience Survey Extravaganza! 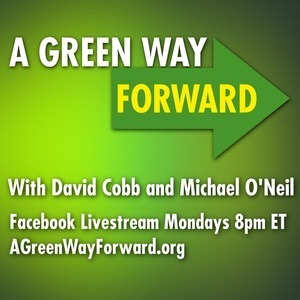 David and Michael cordially invite you to participate in the first ever A Green Way Forward Audience Survey. Tell us what you'd like to see in future episodes, and help us decide how to grow and evolve the show!